In a food processor, blend all the ingredients until dough forms. Press dough firmly and evenly into an 11 inch tart pan. You'll want to press the dough into the sides, creating a little pie crust well in the center. Bake for 10-15 minutes or until your crust is a light golden brown. Remove from oven and let cool to room temperature. 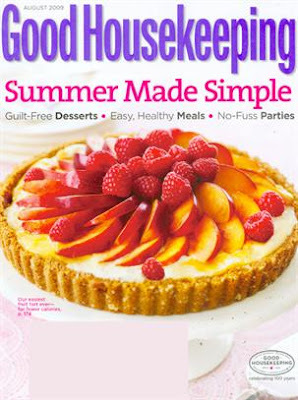 In a bowl, blend Vegan Cream Cheese, Vanilla, Bourbon, and Sugar with a hand held mixer until it is smooth and creamy. Once your crust is room temperature, use a spatula to spread your Vanilla Filling evenly into the crust. I used all the filling, but it's your call on how creamy you want your tart to be and how much you want to add. Then arrange your rinsed, dried and sliced fruit on top of the Vanilla filling very slowly and deliberately to create your pattern. You're going to want to have an idea going into your tart as to what fruit you want where because it will be messy and troublesome to move a slice of fruit once it goes into the Vanilla filling. I suggest fanning and layering your fruit like we did if you want to get the most fruit possible on there. I also like the rosebud look it created. Once your toppings are arranged, cover your tart with plastic wrap and cool for 20 minutes before serving to firm up your filling. When you serve, be sure and remove your tart cover (the ring on the outside of the pan) first if your tart pan come in 2 pieces. It will make it easier to serve and cut. You do this by gently lifting the tart from the ring from underneath. 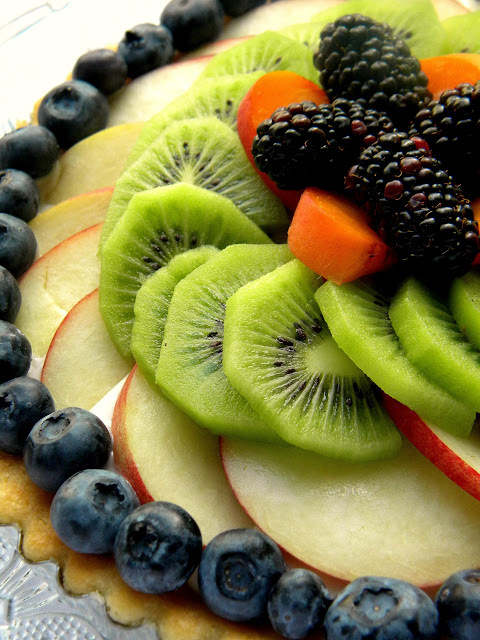 The plate holding the tart should separate from the ring. Again his is only if your tart pan comes in 2 pieces. I recommend practicing a bit before you start your tart. 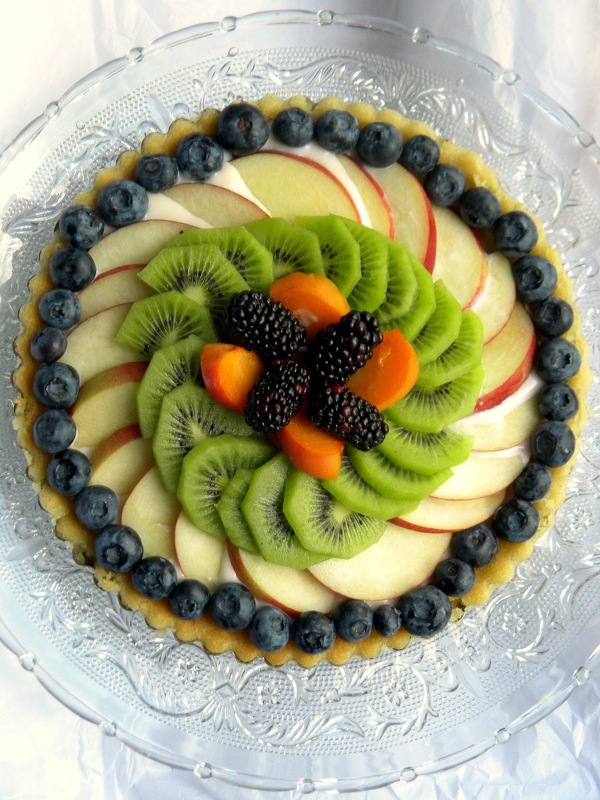 Now this is an unglazed tart, because we love fresh fruit and didn't want to hide it under more sugar. But here's a recipe if you would like to glaze yours. Blend all your ingredients into a bowl with an electric hand held mixer until smooth. If it is too thin for your liking add more cornstarch a pinch at a time. If it is too thick add more Lemon Juice a 1/4 teaspoon at a time. Once you like the consistency, drizzle over the top of your chilled tart before serving. You can also just dust your tart with powdered sugar if that's more your style. I mean really, isn't that another charming thing about this tart... it gives you an opportunity to be creative and delicious all at once. More perfect storming. Holy Moley that looks delicious! So pretty! I've seen those before too, and because I'm naughty, I always picked the fruit-free chocolate or peanut butter dessert or pastry instead. But I'm vowing to eat more fruit these days. So this would be a good (and still kinda naughty) way to start. This looks so gorgeous. I used to love these kinds of tarts. When my (also vegan) friend and I were in France, we got so frustrated with being served cheese on and with everything, I was like "maybe we should start mentioning the word 'vegetalien." And she was like, "I think that's so far off their radar they'll just think we're saying 'vegetarienne' and pronouncing it wrong." Ha! You can also glaze tarts like this the way many French recipes suggest: with apricot preserves or jam strained and thinned out with a little very hot water and brushed on. It really is worth the effort because the glaze makes the presentation elegant and the fruit even more tempting. I <3 making tarts! it's so addictive. So pretty! this looks amazing. Seriously amazing.